Brake’s usage environment for tuned cars is much more severe than racing cars due to their weight and engine output. HKS Brake Fluid series were developed with careful analysis and tests of the actual data from races of various categories. HKS Brake Fluid series can assist reliable braking. Select the appropriate type for the purpose of usage. Finally!! A new brake fluid made for winning! Racing brake fluid for the ultimate performance!! High dry boiling point of 333℃ and the performance equivalent to the highest DOT5.1 specification. R35 GT-R（HKS 1300hp spec.) could withstand the conditions under full-braking at 330km/h. ※Use the fluid all at once. ※Replace the brake hose to a mesh hose. ※Drain the fluid when a vehicle is stored for a long term. Enjoy better performance in sports driving! Wide range brake fluid ideal for sports driving and track event. DOT5.1 spec makes street and circuit driving more reliable. 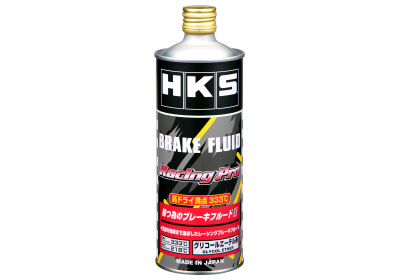 ※For race use, HKS BRAKE FLUID Racing Pro is recommended. The boiling point is higher than the one for street driving, and the kinematic viscosity is also higher; therefore, the brake pedal feeling is more exact while circuit driving. This one is ideal for various uses. Versatile brake fluid for ultimate driving. HKS brake fluid was designed and tested based on various data from the races to proof its performance with a tuning car that requires severe braking. 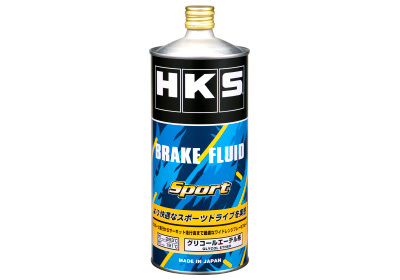 HKS offers 3 types of brake fluid that can be chosen according to the purpose of use, and these assist reliable braking from street to circuit driving. Reliable brake pedal feeling under various street driving conditions. The dry boiling point is 272℃, and wet boiling point is 182℃. But, even in cold district, it exhibits superior viscosity characteristics. Also, the intensive kinetic viscosity analysis enables reliable braking operation feeling to be expected under various street driving conditions.